Mujitsu and Tairaku's Shakuhachi BBQ / Toby, please make one of these for shakuhachi! » Toby, please make one of these for shakuhachi! Toby, please make one of these for shakuhachi! The descriptive copy says "the secret is that a small high-g vibration can silently excite the body of an instrument." Re: Toby, please make one of these for shakuhachi! I wonder if I excited my air column enough, my air would be less sticky. Perhaps a garrote tied between my neck and my shakuhachi? I plugged up the finger-holes of my Yuu with 'blue-tac' putty, wrapped it in my cats' electric blanket, set the temperature to 55 C, waited for it to start warming up and began blowing Ro bukis. Man, this thing is really humming ! Dammit, ed, I ain't no plumb! Again the same issue. Please Toby, admit that it vibrate!!! It cannot do it in a way to influence the sound (as I admited after some ideas exposed in an old topic here on BBQ), but it really do vibrate!!! I have tested it on many many shakuhachi while in the making process when they're without holes, and they vibrate!!! Your posts are really cool, but you must admit or make more tests with that! The The Yamaha WX5 Wind MIDI Controller may be what you have to put up with until then. Didn't Masa use this one Jim??? Indeed he did. But not as or instead of a shakuhachi. If you attach it to your head it will make your hair grow! I have never felt a shakuhachi vibrate, and I have tried very hard. Of course the air under your fingers vibrates, is that what you are feeling? Yes it does vibrate: about 1 micrometer. That's about 1/100 the thickness of a piece of paper. And yes, it doesn't make any difference to the sound. Its very weird to hear you saying that you tryed very hard to feel the bamboo vibrating without ever feeling it. You don't look to have caloused hands to this point. We was playing at a friend house and in a few moments I wanted to check my pitch during some passages, and the mic tuner was unusable with all the sounds around, then a friend asked me to try to clip the shakuhachi with a tuner like this, and to my surprise it showed all notes with a good precision... so it capted the vibes in a way that maybe can be used to our friend shakumoog, hehehe?!? The 1/100 vibration (not constant to all the diferent flutes right? also a question, can two of the most alike flutes, as two cast bore for example, have this 1 micrometer vibes to be a constant? I am not sure about this flutes that can have bores diferences, even in Jiari and what to say about Jimori and Jinashi?) so nice to feel man! But indeed, it needs sensibility. It's not a vibe to the eyes. Not mine at least. The one micrometer figure was obtained using very sensitive accelerometers on a wood-bodied clarinet, but the vibration levels are similar on thick-bodied woodwinds. It's pretty obvious if you think about it: the air pressure at its highest in a flute with open ends is not much, and the bamboo is quite rigid. Basically the vibration of a thick-bodied woodwind adds about 1/10,000 the energy of the total radiated sound. This is a level about -40 dB, which is imperceptible. Think about standing two meters away from your friend and talking very quietly while a loud motorcycle is revving its engine between you. That is the scale we are talking about. Yes a good contact mic can pick it up, but that is beside the point. 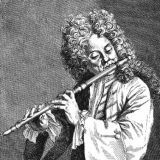 Again I ask you: are you not feeling the air under your fingers and confusing that with vibration of the body, or confabulating when you play a holeless flute? Try having someone else play the flute--touch the body with you fingers (not the holes) with your eyes closed, while listening to loud music through closed-back headphones. Can you really feel when the flute is being played? Basically the vibration of a thick-bodied woodwind adds about 1/10,000 the energy of the total radiated sound. This is a level about -40 dB, which is imperceptible. Think about standing two meters away from your friend and talking very quietly while a loud motorcycle is revving its engine between you. That is the scale we are talking about. Why this is beside this point? How much energy a contact mic need to measure the notes? It can be easier to feel if you don't use just your finger, but hold with the entire hand, embracing the flute, and touching the body of the flute with palm of the hand too. One can close holes with tape and hold in diferent part of flute body (distant of the holes too) and notice where it vibes more or less. In a Ro Otsu situation, its easy to feel the root vibrating in your hand. In a flute yet without holes, the middle of flute has a good vibe too. Anyway, I will wait my friend to come and make the test you sugest. By now, with our conversation, I have been quite crazy about this vibe I feel. Does nobody else feel it? I am feeling like a medium who hear/feel spirits and people that do not hear says him "you don't hear/fell anything..."
Meantime: a BIG hug, from Eddy. You will never win the chikuin argument here, Henrique. If no one else can confirm, maybe Henrique and I should get a check for delirium tremens or so. Not really wanna win anything or trying to impose something, but I would like to hear that more people feel it , and we are not in delirium tremens... I am not saying it helps in sound or that it's a important thing to feel while playing shakuhachi (even because while really playing, we really feel enough vibes from holes.) or whatever, just that it happens.... anyway, I like it, and I can feel it, so if other people can't, I'm sorry because we can't impose it to them as a need. In flutemaking, I noticed that when working for Ro yet without holes, a flute bad balanced will vibe in less spots than when the flute is with Ro almost ready to continue the flute work with other holes... it's like if we can feel were the air is "shaking" more inside the tube and making the bamboo move, and then even say where the air is stagnant, not flowing all that easy... but that's for sure my wacky mind kidding with the game and of course I do not trust in it as a regular technique!! Good to trip with you guys! I am asking a question of the more learned. The term "chikuin"? I have seen many times to describe very expensive high quality flutes as in David Wheeler's website and Peter Hill's, describing a flute as having much chikuin as a very desirable trait and character, referring to vibration in the flute and or the music or notes produced. So if this is well known used shakuhachi terminology and used by the knowledgeable then why is it that only Kees and Musgo are the ones feeling it and it is sometimes used as a desirable selling point to advertise a fabulous flute? Then chikuin does exist as a feature heard and felt on a flute, mostly the high end ones. What say , all? Well, in retrospect the term chikuin is rarely used, so it is possible certain flutes exhibit more chikuin, some less, and some very , very, little measured in hundreths of microns, and most not at all. But it seems to be a shakuhachi term of Japanese origin, so someone in the past has experienced it enough to give it a name. Entering Nelson Zink territory here.